The Cauliflower Colt Coral is also referred to as Colt Coral, Soft Finger Leather Coral, Seaman's Hands Coral, or Blushing Coral. It is very difficult to identify an exact species because there is so much variation of shape and color within each. It is slippery to the touch, encrusting, and usually has small colonies. Members of the Cladiella genus generally have shorter "fingers." 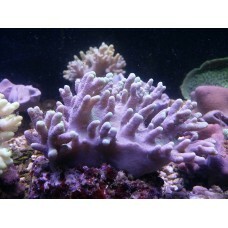 It is an aggressive coral and needs space between others and itself in the reef aquarium. Particular care should be taken to place Sinularia or Sarcophyton corals out of its reach, as the Cauliflower Colt Coral will readily kill these species. 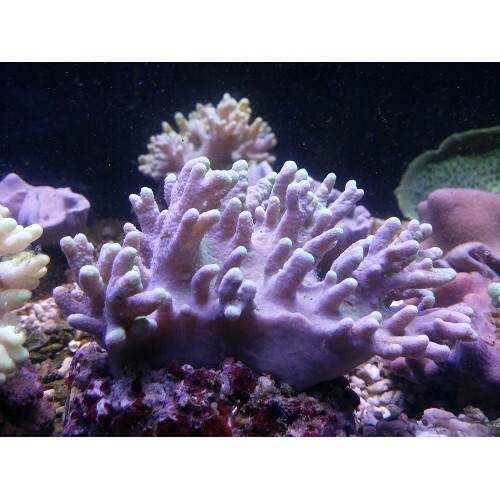 It is very easy to maintain and makes an excellent coral for the beginning through expert reef aquarist. It requires medium to high lighting combined with a medium to strong water movement. For continued good health, it will also require the addition of strontium, iodine, and other trace elements to the water. Culturing by the experienced hobbyist requires snipping off a piece of its tentacle and attaching the cutting to a solid structure such as live rock. The symbiotic algae zooxanthellae hosted within its body provides the majority of its nutritional needs from the light driven process of photosynthesis. It will also benefit from additional food such as micro-plankton, baby brine shrimp, or foods designed for filter feeding invertebrates. It is normally shipped attached to a small piece of live rock or coral rubble. The Maricultured Coral is shipped on a natural "rock like" plug that can be placed easily and securely in or between rockwork in the reef aquarium. Be aware, it will often secrete a mucous coating during shipping to protect itself. To remove this slimy coating, just rinse it vigorously in seawater before placing in the aquarium.